The Apartment Association of Tarrant County has its own “posse” of protection in place — seven law firms who offer special benefits to AATC members and provide continuing education at bimonthly “Lunch & Law” programs at AATC’s headquarters. Kimberly Sims is one of the Magnificent Seven featured on the cover of this month’s Dimensions Magazine, published by AATC for its membership. 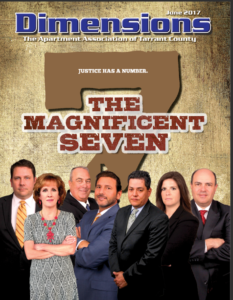 Read more about the Magnificent Seven in the June issue of Dimensions Magazine.